The new SQ-520 full-spectrum, smart quantum sensor can be connected directly to a computer via USB for taking spot measurements or graphing and datalogging real-time PPFD using the included software. The sensor can also act as a stand-alone PAR datalogger by simply connecting it to most standard 5 V DC USB power plugs. Internal memory within the sensor head is capable of storing 10,000 user-specified periodic measurements that can be downloaded as a CSV file to a computer for analysis. 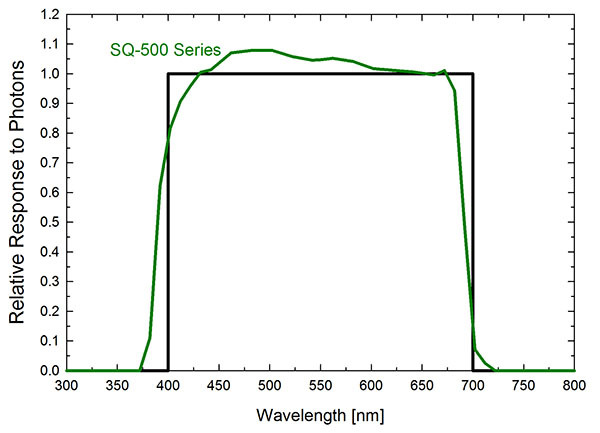 The improved spectral response of the SQ-520 increases the accuracy of LED measurements making it ideal for use with both natural and electric light sources. The sensor can be connected to a desktop, laptop, or tablet computer via USB 2.0 type A plug, to be used with the Apogee software (windows compatible, XP and later; Mac compatible, 10.10 and later). The included ApogeeConnect software gives the user control of data logging and calibration settings, provides a real time output display and graph of PPFD measurements and allows the data set to be saved as a csv file. Click here for more information on ApogeeConnect software for USB sensors. The sensor has internal data storage capability with the ability to hold up to 10,000 measurements. This allows the sensor to collect data while connected to most stand-alone 5 V DC power supply such as a USB wall adapter.